You are invited to explore the various international activities of the Department of Forest and Natural Resources Management (FNRM). We welcome students from outside the United States who have interests in international forestry and who may wish to undertake graduate research here in central New York, back in their home countries or elsewhere. International visiting scholars have found they share interests with and are stimulated by study and contacts made on our Syracuse campus. Our Faculty are involved in international work through academic and other institutions abroad where teaching and research activities are enriched through exposure to diverse cultures and approaches to resources management. 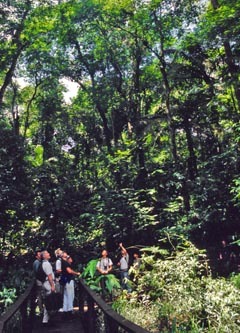 The International Forestry Committee coordinates programs and activities within the FNRM. We appreciate your interest - use this site as a source of information, as a link to other related sites or as a means by which to contact former SUNY-ESF students as well as current Faculty.